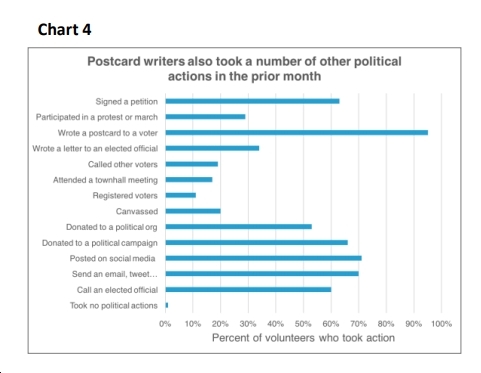 Postcard writing has gained momentum within the resistance movement both to contact elected officials and to connect with voters. Whereas modern day campaign mailers are slick and mass produced, the hallmark of the resistance postcards is their low-tech and personal approach. Each card is a handwritten, individual note crafted by a grassroots activist, many of whom are new to activism. Little research exists on the use of personal notes in campaigns and even less on the impact on the writers. Social psychology research has found mental health benefits from writing, especially in dealing with traumatic events (Pennebaker & Chung 2007). Research also shows that sharing positive social experiences with others promotes feelings of meaning and purpose in life (Major, Lundberg & Frederickson, 2017), which may have direct implications for sustaining volunteer engagement in political activities. 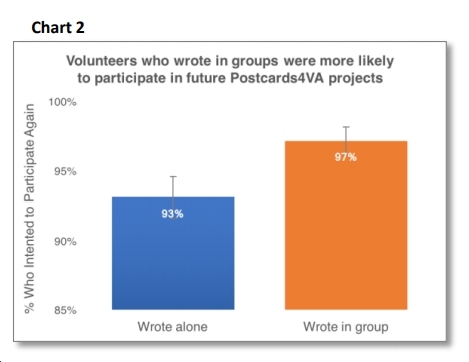 With these results in mind, Postcards4VA (a grassroots Virginia group) and CitizenBe (behavioral science research firm) surveyed 619 volunteers who had committed to participating in Postcard4VA’s 100 Postcards Challenge for the 2017 Virginia election to study the impact of writing postcards on the civic engagement of the writers. The 100 Postcards Challenge resulted in over 137,469 postcards being mailed in support of 28 Virginia House of Delegate candidates involving some 1600 registered volunteers. The true number of volunteers is likely much larger because many engaged friends and family who were not officially registered with the Challenge to help write their 100 cards. 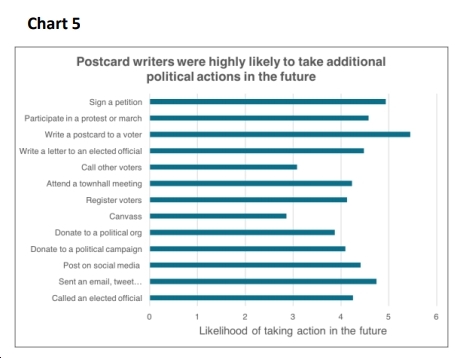 The study found that the social and emotional elements of writing postcards can increase civic engagement in terms of emotional outlook, scope of involvement, and likelihood of continued participation. Winning may change memories of past volunteer experiences and make people more likely to participate again in the future. In our study, some participants completed the survey before the election and some completed the survey after the election (and thus were aware of sweeping Democratic victories). 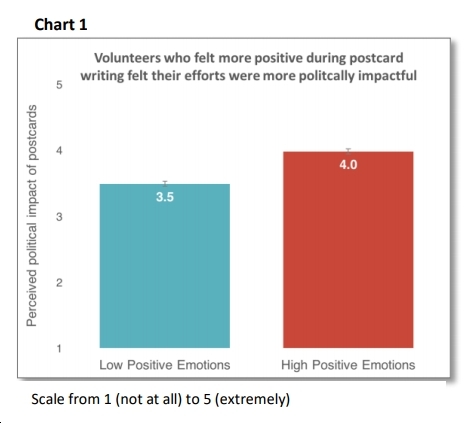 We found that participants who completed the survey after the election (compared to those who completed it before the election) reported greater levels of positive emotions during postcard writing, greater perceived impact on the political system, less burnout, and greater social closeness to other volunteers. 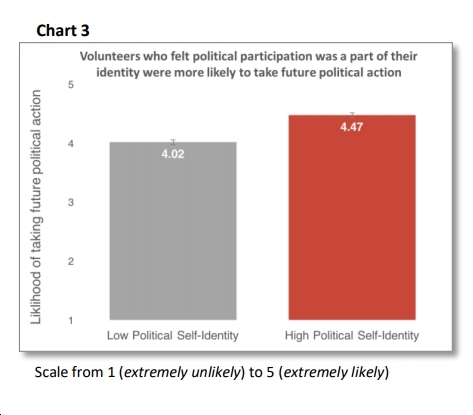 We speculate that knowledge of Democratic victories may have enhanced how people remembered their volunteer experiences. Postcard writers believed their postcards would have an impact. Almost all postcard writers were 35 and older with 48% being over 55. This profile matches those motivated for political action after the 2016 election, the resistance. Postcard writers were college educated, many with advanced degrees. Over 70% of postcard writers participated in the Women’s March. All postcard writers of voting age were registered to vote. Participants expressed a strong interest in writing postcards for future campaigns. Pennebaker JW, Chung CK. 2007. Expressive writing, emotional upheavals, and health. In Handbook of Health Psychology, ed. H Friedman, R Silver, pp. 263–84. New York: Oxford University Press. CitizenBe (citizenbe.org) is a non-profit group of social and behavioral scientists that works to create and sustain impactful political participation. We help groups become more effective through evidence-based research and testing. Postcards4VA (postcards4va.com) is a grassroots postcard initiative dedicating to flipping Virginia’s elected officials blue.